On November 25th, Brillantmont kicked off the first ever Anti-Bullying Initiative in an effort to bring about awareness around issues related to bullying, to provide a forum for open discussion among the student body. Spearheaded by the school’s Drama group and the PSHE department, during the week activities took place, including an opening skit at tea time on Tuesday, an Education-in-Theatre workshop for middle school on Wednesday, and a closing ceremony on Friday. In PSHE, throughout the week, student discussions about bullying and its effects allowed our students to reflect on what they see and hear in the corridors every day, and how their behaviour may be perceived by those around them. In the theatre-in-education workshop, the drama club led a discussion about standing up for people that may be being bullied. In the 7th Grade English class, one group discussion led to the desire to redefine the word ‘cool.’ Students felt that at the root of the word is the notion that cool is being popular and in fashion, which can lead to some people being left out. 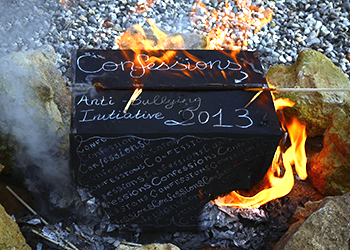 On Friday at the closing ceremony, the 7th Grade students, along with the student leaders, sported badges that read “Kind is the New Cool.” Throughout the week, we asked students to write down confessions anonymously on the theme and place them in a box which we burned at the closing ceremony. This was symbolic of burning away any bad karma and starting anew. A special thanks to our head of PSHE, Julianne Brown and the Drama club for taking the time to put the events together for our Brillantmont family. The message was clear - BE AN UPSTANDER!